For anyone, who may not be familiar with it, Lumiere is an acrylic paint that has pearl tones. It used to be sold by Stampin' up, but they retired it along with Pearl ex (the powdered pigment that you can add to Lumiere.) Both are made by Jacquard. Add a layer of reinker wash over top--as though water colouring (shading etc... the way you like to) This is a mix of Basic Gray & Black craft ink and water. The Black craft gives a purpley hue, kinda neat. Lumiere mixes beautifully with reinkers/ink refills. Who knew?--probably some of you gals/guys, but not me! ;0) (This is Pearl White Lumiere; there are colours as well). Paint your Lumiere mix onto a stamp (or just plain Lumiere). so that the lumiere paint does not dry on it. 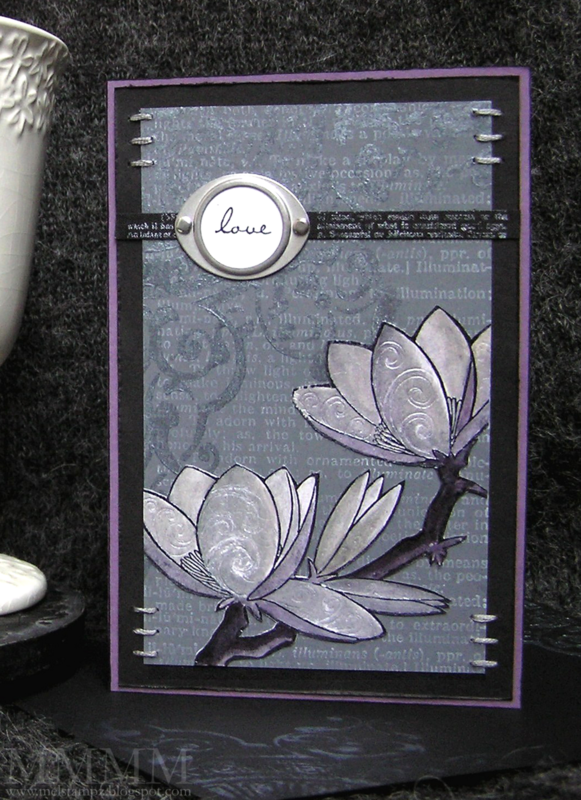 A dry brush technique is a great way to fill any areas that were missed in stamping. You can leave as much or as little of your Lumiere mix on the brush as you'd like. I try to work in little dots so it doesn't look too different from the stamping. Lumiere is nice & wet, so you can emboss it. Of course, if you powder it right away, you'll get lots on there (but you can wait a bit and get a distressed embossing kinda look 'cause less embossing powder will stick.) This is just clear embossing powder. Accessories: embroidery thread (Pewter gray 457), Hodge podge hardware styled silver circle (tag & brads), Strip cut from 7gypsies gaffer tape Le Monde (tinted with Black Stazon to reduce contrast of white text), Black marker to distress edge of Plum card. Thank you all so much for bein' you! It warms my heart to know you're all out there making art! There are lots of things I like about this card. If I keep listing, it will be the longest comment. So let me just say, you are brilliant! OMG!!! You never cease to amaze!! Rock on! I have Lumiere in my stash and have never used it! Will have to dig it out and give it a try...your card is amazing! I love Lumiere! I actually love all the Jacquard paints. . .I buy them in sampler sets and they are so reasonably priced. Wow, your painted images are absolutely stunning!! The flower is so pretty! I love the shimmery effect. . .GORGEOUS!! Beautiful card! Thanks for another great tutorial! I love that corner stamp of yours. That lumiere has a cool look to it. Very nice card!!! Great tutorial. Your card is absolutely beautiful, it's like a work of art. Amazing card!! I totally adore it. The shimmer is just like real silver. Just beautiful Mel!!! I have a few colors in Lumiere so will have to give this a go. Gorgeous and what a great share on Lumiere! I'd be glad to send some heat your way.. Here in Southern Ontario it's a sweltering 40ish with the humidex. I'm off to the basement where it's much cooler ... temperature and stamp activity hehe. How wonderful is this, dying to have a go, you amazing lady you. This has "WOW" written all over it and is absolutely gorgeous, Mel! I've never worked with Lumiere before, guess I'm gonna have to make a trip to HL and pick some up! Thanks for enabling my habit *giggle*. That is so pretty...almost looks like mother of pearl! AMAZING! You are truly amazing! This is absolutely gorgeous! I think if I could go to any stamper's house to play, you would be the TOP of my list!! Gorgeous...I have never used this stuff...now I have something to buy at Mike's next time I have a coupon! Gorgeous card Mel! I haven't played with my Lumiere in so long. You always remind me of long forgotten stampin' toys. I LOVE it! Thanks so much, this is great info Mel. And lovein this card, it's stunning. As for it being chilly there, I'll send you all the warmth you can handle. It's 41C (Humidex) here in Ontario, so help yourself to the warmth. M - how astoundingly beautiful! I have to admit, my favorite thing to do with Lumieres doesn't look a thing like that! Still, it is a useful trick - I paint it onto release paper in about 3 or 4 layers and peel it off and use it as metallic paper. If you are careful, it accepts ink nicely and you can glue it without too much trouble. After all, it is plastic! very awesome....love your card....and your pen embossing....great idea!!! man! not *ONLY* do you find so many COOL things to show us, but to take pictures along the way!?! Holy cow! this is just beautiful-beyond beautiful! thank you for sharing this and your work!! Wow! Incredibly stunning! Love it!!! I like the mother-of-pearl effect it gives to the leaves. wow, that Lumiere stuff looks amazing! I may have to hunt some down! This is gorgeous as is the rest of your blog, thanks for sharing soooo much information! Very beautiful! Thanks for showing us how it is done! Hi Mel, I have just been told about your blog and am gobsmacked at all the fabulous works of art. This Lumiere card is stunning! !Thank you also for the fabulous tutorials and tips etc.